Industrial land owners with large surplus properties in central locations hold the key to one of the critical challenges of re-urbanization, the creation of new places with scale and critical mass. Not only does the redevelopment of such sites provide an opportunity to transform urban communities, but it will enable impaired land owners to maximize the value of their underutilized properties. Proactive cities recognize the role that real estate can play in driving sustainable growth. In fact, many have well-established regeneration programs in place to help transform previously used or environmentally impaired land. In an effort to create rejuvenated urban landscapes that leave a lasting, sustainable heritage, developers and investors in real estate want to minimize risk and maximize returns for redeveloping environmentally stressed properties. Given the clear potential for surplus properties held by industrial ﬁrms and public sector organizations in urban locations, what is holding back redevelopment and what can be done to more effectively bring these sites into productive use? The answer is complex. It remains a challenge to align the interests of industrial land owners, developers and city authorities, particularly where the owner may have a large portfolio of property in many cities, and when investing in regeneration is an expensive business. Better quality information that accelerates the identiﬁcation of cities and sites with the greatest development potential will simplify and increase the certainty of the decision-making required. While key indicators in real estate markets provide a baseline for short-term trends affecting residential and commercial development, they don’t capture the long-term redevelopment potential of cities or the relative challenge of remediation. 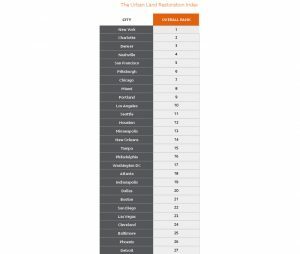 The Arcadis Urban Land Restoration Index (ULRI) tackles these issues and identiﬁes the cities where sites are most cost-effective to clean up while providing the greatest potential for long-term uplift and returns for residential, commercial, and mixed-use development. 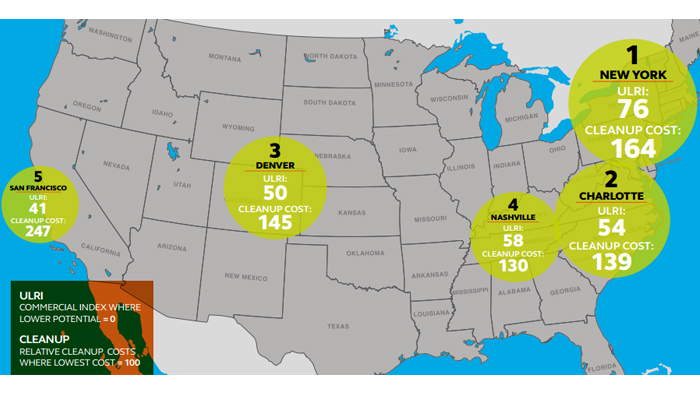 In effect, the ULRI highlights the best locations to unlock value from surplus property with environmental liabilities in key cities across the United States. By enabling industrial land owners, city leaders and developers to focus on common opportunities, the ULRI will help to unlock the potential of surplus industrial properties – breathing new life back into communities, creating a lasting legacy for citizens, and generating signiﬁcant returns from prime, underutilized land.